Finally my 14th level! The pink lady and the strange thing. Sounds weird doesn't it? 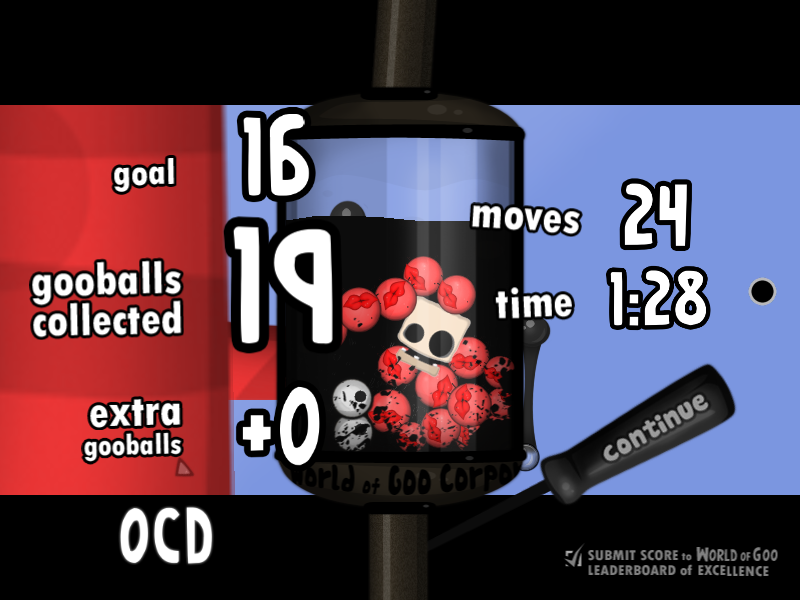 If you want to get the OCD (Which is 19 Goo Balls), then you have think where you can get the 19th Goo Ball. Have fun! Very nice level. Rather big, but cool and all that. 0 moves. Do you know that I want to change my school levels? They will be all together in one download so may be then you will can publish it! one move, only 'cause i'm not good at flinging goos at structures to make them move. Good point, Wikigoo. 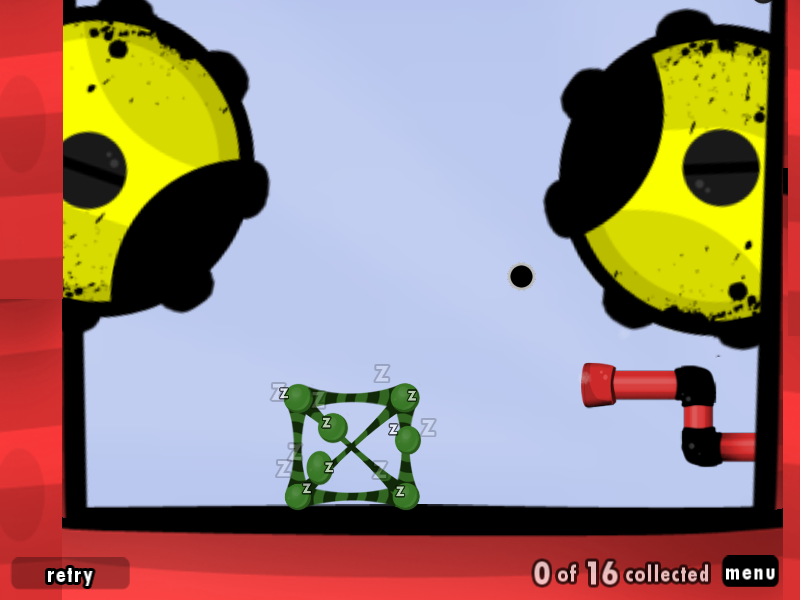 It's actually kind of fun to carry the Bone Goo Ball over on top of the spikey thing. Kind of slow, since I was letting the water Goo Ball I set on the other side of the spikey thing rock it back and forth into the forcefield. But still resonably fast. My record for time is 11 seconds. Less should be possible, but you'd have to get kind of lucky. Good job, MOM4Evr! 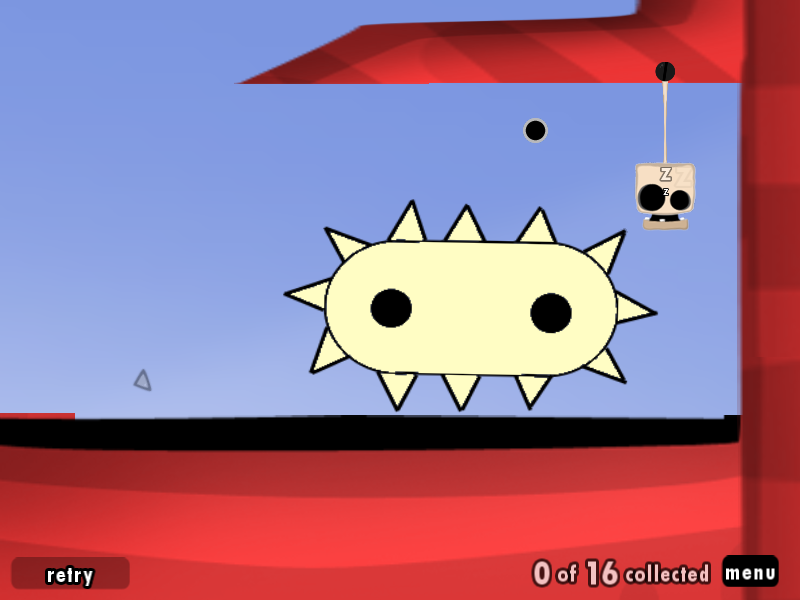 Kirdneh, to get 0 moves you have to push the strange thing to the RIGHT (At first) because strange thing is detaching so it can detach the bony goo ball. Bony will still going to sleep in that time but for the moment it will be OK. Then you need to push the strange thing to the LEFT so it will go and detach the goos that are hanging the beauty. Then you have to take some goo ball and push the bony to the LEFT until it gets to the lining and wakes up. 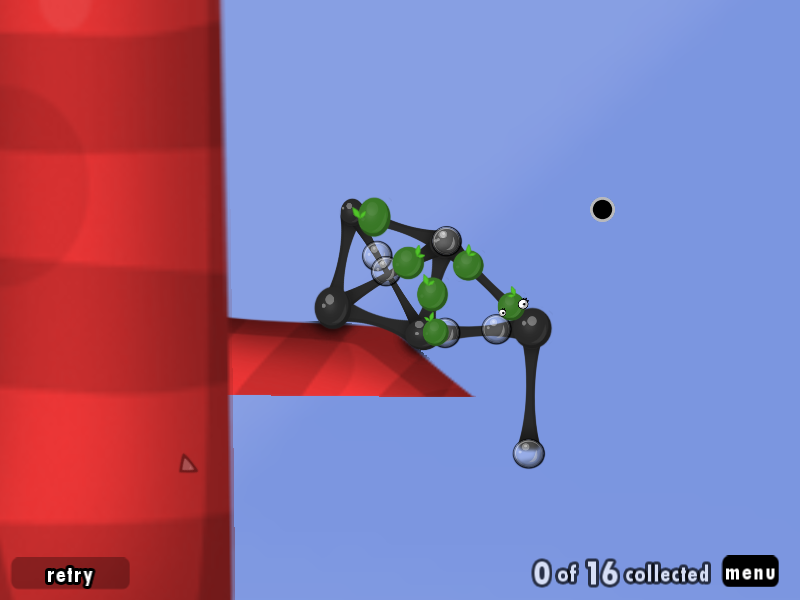 Then you just push the Ivy goo ball lining to the pipe and finish the level with 0 moves and OCD (19 goo balls)! The thing is that the bony is going in the pipe ! Actually, you have to carry the Bone Goo Ball over with the spiky object, as Bone goos cannot be kicked by other Goo Balls while they are sleeping. Easier is that you just at first carry the spiky thing to the bone to it will detach it and then you will have to push the thing to the left. After that just push the bone goo ball there where you needed to push the strange thing. Thats more simple! Cause thats what I tried! Wait I think he talked about flying goo structures - you don't need to fly them in this level you just push them a little bit until they get to the pipe! Go ahead, try that. 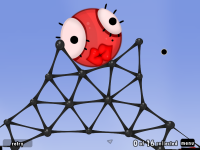 It's impossible, since the Bone Goo Ball cannot be moved while it's asleep. Then how did I do that? You actually need to push that ball little bit because the force field will going to move it when you gat the goo ball to the force field. And why don't you publish my level "Ivy mask"? Wait no... ! I needed to tell you that when the strange thing detaches the bone goo ball then the bone falls on it and the thing goes diagonally more to the right side and the things gets heavier! 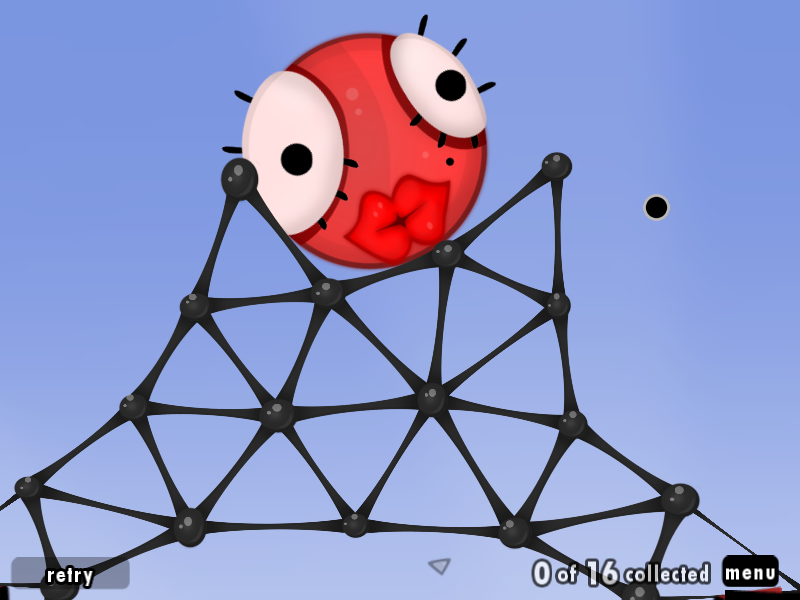 Goo ball stays sleeping, sitting on the thing and then you can push the thing altogether with bone goo ball!!! I've been forgot about it! I said it twice, actually. Well, if you're making good levels, then I would logically expect everyone to rate it as "good." And the levels you have uploaded so far are quite easy (some of your more recent ones are harder, and that's pretty good). Please realize that a lot of folks on this site have been playing the game for days or weeks solid, and after playing it for that long, you learn a trick or two. I'm in school now and I've got free lesson so I'm on goofans where ever I can go on it and... Teacher is putting scary videos on he's computer at school! Do you know that video "Scary chair"? I got 12 seconds for 0 moves.